The start of the module 1 test involves you parking the motorcycle in the coned area onto its stand. Continuing on from this, you’ll be asked to demonstrate the slalom and figure of eight exercise. The slalom and figure of eight are two separate exercises that are combined into one. If you completed compulsory basic training, you’ll have experience of the figure of eight exercise during element c. The slalom and figure of eight exercise for module 1 practical riding test is to assess your ability at riding the motorcycle slowly, keeping good control in terms of speed and manoeuvering whilst maintaining balance. After the parking exercise, the examiner will ask you to get back onto the bike, take it back off of the stand and start the engine. The examiner will explain that they would like you to ride between the first and second yellow cones to demonstrate the ‘slalom’ exercise. 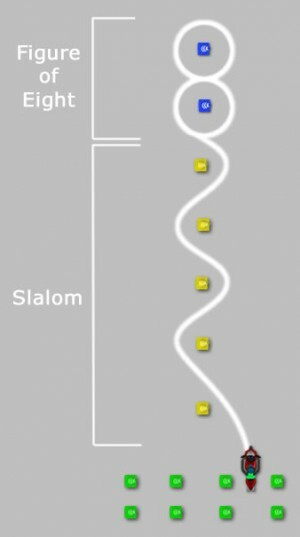 Continue the slalom until you reach the final blue cone where you are required to demonstrate the figure of eight exercise. Continue with the figure of eight exercise until the examiner signals you to finish, typically after two complete repetitions of the exercise. The slalom and figure of eight exercise requires proficient use of the clutch, throttle and brakes. Depending on the test centre that you attend, circuit layouts may vary and be to the left or right. The diagram below represents a typical ‘left circuit’ used at many test centres. Before moving off, as always observational safety checks are essential else this can easily fail a test if they are omitted. Keep the revs up at around 3000 rpm to avoid staling and use the clutch and rear brake to adjust speed. Move away and maintain a steady speed of a walking pace. Avoid putting a foot down during either exercise. If you feel that you are losing balance and are going to put a foot down, gently increase your speed by slightly releasing the clutch to bring the bike back up straight. Or if you feel your speed is increasing too much, dip the clutch and use the rear brake (never the front brake during a slow exercise) to slow the vehicle. Use of the clutch needs to be subtle else you risk jerking the bike and losing balance. To help in maintaining balance, it’s important to look ahead in the direction of travel and not down at the ground. For the slalom part of the exercise, keep reasonably close to the cones as riding too wide between each cone will result in harsher turning angles making the slalom exercise more difficult. The figure of eight exercise on the other hand is easier when riding wide. This can be as wide as you like within reason, so on exiting the first blue cone after the final yellow cone to start the figure of eight exercise, take a wide turning circle to make is easier to come back round.